My son is 16, has just finished his GCSEs, and needs to start earning his own money, and not rely on the bank of mum and [step] dad! Over the summer he’s going to be doing odd jobs for my parents and be paid to do so. He’ll get an hourly rate, and learn that if he wants money, he’s going to have to earn it. I have worked from a young age – always being able to earn my pocket money by working in my dad’s pub. I remember when I was 17, and had just passed my driving test. I had some inheritance money that I wanted to spend on my first car. My parents were wary of letting me have that money, saying I should leave it to continue to grow interest. But I was adamant I wanted a car, NOW, and that it was my money and what was the point of learning to drive if I didn’t have a car… so they allowed me to take out all of the money – £1000 to buy my first car and insurance. I crashed that car about 6 months later and it was a write 0ff. I was without a car and without that £1000. Should my parents have held out, made me save my money for a car? Would I have just continued to sulk and pout until I got my way? Would I have still crashed the car had I saved up £1000 instead? I was talking to my mum the other day, about learning lessons in life – parents are there to guide you, but at the same time, they have to allow their children to make their own mistakes… even if they are big doozers like the one I made when I was 17. I’m pretty sure in the 20 years since that happened, my sister and brother still have that money in an account somewhere, and a lot more money that was initially left for each of us. I don’t. I chose to spend it when I was 17, and I know some years later I regretted that, especially when I found myself in a bit of a financial crisis. I got my first credit card when I was a single working girl, and was smart enough to pay off the balance, in full, each month. I then met a guy, we moved in together, spending more than we should, but we had credit cards and store cards and I had a huge overdraft, we were young and carefree and you don’t think of the future too much. Then I became pregnant, and stayed at home to raise Liam. Relying on one income, suddenly, the debts that we were paying off in full, were mounting up, and being charged interest left, right and centre. I knew we had to sort it out, but it was like fighting a losing battle. I got in the habit of writing down all of our spends and checking my bank account daily for what would be coming out, but was permanently in the red. We never had any spare money, but got by somehow. In 2003, we split up. All of the credit was in my name. I was left with thousands of pounds worth of debt… and it’s only recently that I’ve managed to pay it all off. My parents were not able to help me. I’d got myself into this mess, and I had to get myself out of it. I’m proud to say that I did. do I really need *insert purchase here*? do not rely on others to get you out of your financial mess! I opened a savings account for my son when he was born. Money that he received for birthdays and Christmas went in there. As he’s gotten older, he wants to spend the money himself – going out with his friends, buying his own clothes etc. I always ask him “do you really need to spend/buy that?” And if he says “yes” I let him use the money – even if I think it is a complete waste, or I remind him that he’s only got ‘x’ amount of money left, and when it’s gone, it’s gone! I think it is vital for my son to make his own mistakes and learn from them. This may sound harsh, but I’m a firm believer in that you will learn the right way from doing the wrong way. Keep a track of your spending habits – keep a diary of where your money goes, it helps you to visibly see what you spend and it may help you one day if you ever need to cut back on your spending. Open a current account – this is where you will keep and manage your money for your every day needs. Learn how your account works and any fees and charges associated with it – especially for overdrafts. Check your account daily – I give this advice because knowing what your account is doing every day can help to avoid bank charges, as well as allow you to keep an eye on your spending/saving. Save something – no matter how small, put something away for a rainy day, for when something unexpected comes up, or for when you want to make a larger purchase. Think twice about credit cards – search for the best interest rates, and only spend on it when you really need to. Pay off your balance in full each month if you can, to avoid charges, and if you can’t do that, may more than the minimum required. And don’t be afraid to transfer your balance to a lower interest card! Establish your credit rating – one day you are going to want to get finance for a large purchase – a house for example. So getting a credit rating behind you now will help you in the future. Set a budget – be it daily, weekly or monthly. By allowing yourself a certain amount of money in a set period, you will learn how to manage your finances and hopefully, not spend beyond your means. Identify your wants and needs – you may think you want that super awesome thing now, but do you actually need it? Do you need to pay your phone bill first before going and buying something you want, like a new pair of football boots, when you’ve already got a pair. Shop around – get the best bang for your buck! These days you have so many options available when it comes to searching for the best deal on a product, use those options to your advantage so that you don’t spend more than you need to. Think about the future – one day you are going to need a deposit for a property and a pension. You’re never too young to start putting money away for these things! 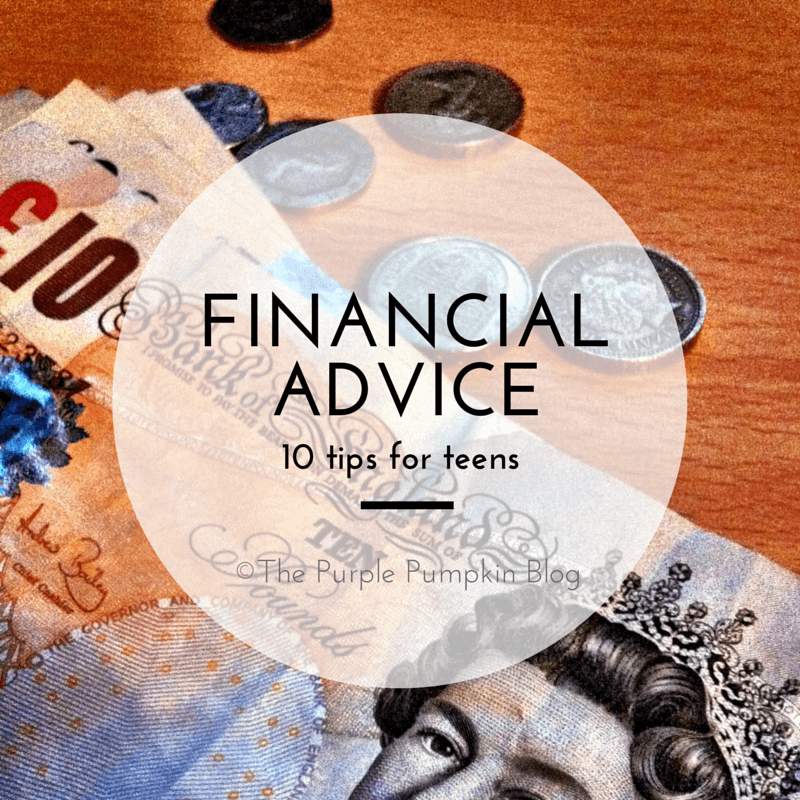 My teen has a saturday job which means she has her own money luckily – but September sees her off to Uni and she will have to quickly learn how to live to a budget! Some great tips that everyone should take on board. You’re right, not just for kids! These are all very wise tips. It sounds like you’re doing a great job of teaching your son about finances. What great tips and it turns out that kids actually listen to parenst money advice! It’s always good when they do! I got my first job at 16 and put all of my wages into a savings account. My father was a bank manager and my mother was a finance director so they taught me how to deal with money properly! I wish I had been as wise at 16!